If you’re considering deferring your social security benefits, a reverse mortgage may enable you to do so. A reverse mortgage allows you to tap into a portion of your home’s equity and eliminate your monthly mortgage payment.3 With your increased cash flow, it may be possible to postpone accessing your Social Security - thereby increasing your benefit amount once you begin drawing payments. Read on for an example of how a reverse mortgage helped Susan defer her Social Security. Susan Parker earned $60,000 per year as a systems project manager until she lost her job nine months ago. At 63, she was having a difficult time finding another job and was considering retiring early. She knew that this would mean lower lifetime Social Security benefits than if she deferred until age 70, but what else could she do? She had exhausted her unemployment benefits and was drawing down on her savings to pay for her mortgage and other living expenses. A reverse mortgage loan helped Susan pay off her existing home mortgage and improved her monthly cash flow by $1,500. She also elected to receive her remaining reverse mortgage loan proceeds in equal monthly payments of $1,091 for as long as she lives in the home. She was in excellent health and expected to live well into her early 80s. 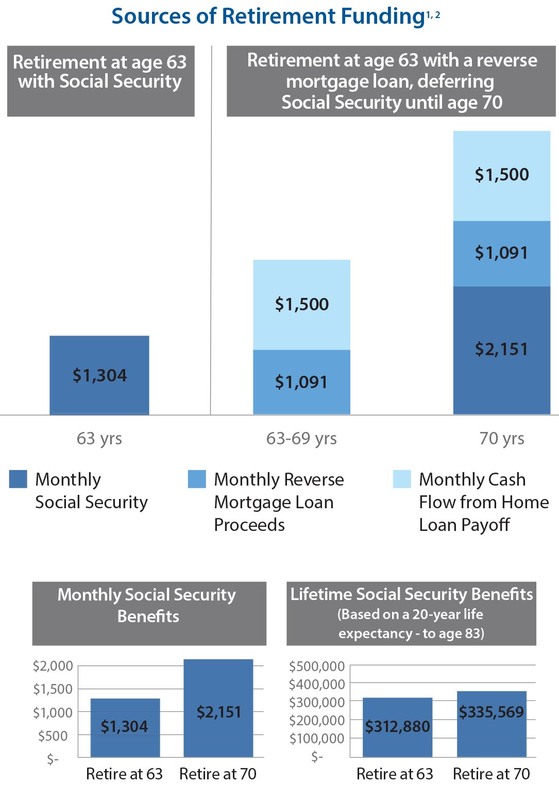 With these additional sources of funds, Susan could defer drawing her Social Security benefits until age 70, resulting in increased monthly benefits of $847 or $22,689 over her lifetime. At Liberty Home Equity Solutions, Inc., our goal is to help you determine if a reverse mortgage is a good fit for your financial plans. Contact us today to learn more. Click here or call 877-410-6663 to talk with a Liberty licensed advisor. This example is based on the youngest borrower, who is 63 years old, a variable rate HECM loan with an initial interest rate of 2.436% (which consists of a Libor index rate of 0.186% and a margin of 2.250%). It is based on an appraised value of $500,000, origination charges of $6,000, a mortgage insurance premium of $10,000, other settlement costs of $2,244, plus a lender credit of $500, a mortgage pay off of 100,000; amortized over 240 months, with total finance charges of $481,472.91 and an annual percentage rate of 8.65%. Lender credits and interest rates may vary. The preceding example and any calculations therein are hypothetical and are for illustrative purposes only. We do not guarantee applicability or accuracy in regard to a client’s individual situation or circumstance. Information contained within this financial strategy is not intended to replace qualified, professional investment and/or tax advice. Reverse mortgages may not be appropriate for certain individuals and some restrictions may prevent a homeowner from obtaining a reverse mortgage loan. All reverse mortgage borrowers are required by the federal government to meet with HUD-approved counselors to determine loan suitability. Failure to pay property taxes, hazard insurance, or maintain the residential property can result in a loan default requiring immediate repayment of the loan balance or foreclosure. Interest, mortgage insurance and other fees will accrue annually until the loan balance is repaid in full.